Spinal surgery should always be the last resort, when it comes to treating chronic back pain. The spinal cord is part of the central nervous system. The density of important nerves in the area around the spine makes this area particularly vulnerable to the side effects of open back surgery. In many cases, open back surgery is not successful in reducing back pain. One of the reasons for this "failed back surgery" is the formation of scar tissue in the area of the spine following the surgery. Avoiding trauma and tissue injury (which is inevitable with open spine surgery), is the main advantage of minimally invasive spine surgery. Large-scale, often painfully irritating, surgical scars are avoided. A successful endoscopic spine operation requires precise diagnostics and localisation of the root-cause. This requires the surgeon to have highly sophisticated diagnostic and neurosurgical training. Bijan Ganepour, Expert Consultant for Spine and Neurosurgery Bijan Ganepour as a Senior consultant for Neurosurgery, has over ten years experience in spinal - and neurosurgery. He is a highly dedicated and experienced diagnostic expert, with a passion for ascertaining the root cause of chronic back pain. In more than seven years as the senior neurosurgical consultant at the County Hospital of Klagenfurt in Austria, he gained both extensive clinical experience and a critical understanding of the value of both traditional and cutting edge techniques in spinal surgery. The advantages of minimally invasive surgery have been known for decades. In many areas of medicine and particularly in orthopaedics, minimally invasive procedures are already standard. However, the area of spine surgery, was one of the last areas of medical expertise, to successfully enter the age of minimally invasive intervention. This delay was partly due to the high technical requirements in this field of medicine. The surgeon requires high resolution intra operative x-ray guidance and effective image converters. The endoscopic devices for minimally invasive spine surgery require high resolution optics. This equipment can be very expensive and the training is very demanding. This is one of the reasons, why endoscopic spine surgery (MIS) is offered in only relatively few clinics. The last and most important condition for successful minimally invasive spine surgery, is a highly trained surgical team, which together has mastered this particularly demanding area of surgery. The limited area for endoscopic vision and the surgical action required in the target area, are very demanding in terms of the surgeons diagnostic expertise, technical abilities and surgical performance. Surgery through a tubular device, avoids large incisions in skin, muscles, nerves and bones. The typical endoscopic access to the spine requires an incision of less than 1 cm. 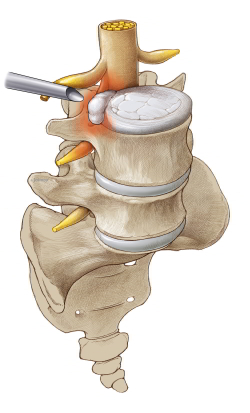 For both spinal disc protrusion and for spinal disc herniation, the endoscopic approach has been particularly successful in avoiding open surgery in the last two decades. It is possible for most of the complications of open back surgery to occur with endoscopic spine surgery (MIS), but they occur much less frequently. Material from herniated spinal discs can be removed through small instruments. Constant supervision and documentation of the surgery with the endoscopic camera. After 30-45 mins the procedure is finished. Immediate mobilisation of the patient on the day of the surgery is possible. Physiotherapy starts the day after endoscopic back surgery. Treatment should be continued as outpatient physiotherapy. When will your spine specialist suggest an alternative treatment? Please contact us for a thorough investgation and to discuss other treatment alternatives. Minimally invasive spine surgery is very promising and has the distinct advantage of all endoscopic surgery (avoiding soft tissue and bone trauma). It gives the patient a much faster recovery, with a reduced surgical risk. But compared to other surgical approaches to spine surgery such as micro surgical open spine surgery (under the microscope) MIS spine surgery is relatively new. Clinical research is still limited for many MIS techniques and indications. The short term results are very good, but long term follow up data is limited. Lack of established guidelines for MIS: Many decisions involving Minimally Invasive Spine Surgery do not depend on established guidelines, but on the individual experience of a highly specialised surgeon. The limited field of vision under endoscopic view reduces the ability to respond to intra operative events. In some cases the endoscopic approach might have to become open spine surgery during the procedure, if the situation turns out to be different to expected. For example a disc herniation can be larger than expected, or the eruption includes areas of the spine not yet accessible by endoscope. MIS-training is not yet part of the standard training for spine surgeons in many training centres. Patients should check the experience and training of their spine surgeon very carefully.